It's the last day of the Mobile World Congress 2011 today, and we thought we'd wrap up what we consider the most enticing tablet offerings we set sight on at the Expo. 1. HP TouchPad - a refreshing step away from the "me too" world of Android tablets, the first tablet with the excellent webOS mobile operating system was showcased once more at the MWC Expo, and we came away impressed how fluid and natural to navigate webOS has become when grown up to a tablet size. Not to mention the dual-core 1.2GHz Snapdragon chipset. A real disappointment here is the summer release, as well as the lack of a rear camera and HDMI port, but the HP TouchPad has the rather cool Touch-to-share function. 2. LG Optimus Pad / T-Mobile G-Slate - Along with the LG Optimus 3D, the Optimus Pad (or the T-Mobile G-Slate, as it will be known in the US) tablet represents the manufacturer's intention of introducing 3D to the world of tablets and cellphones. The Optimus Pad may lack a glasses-free 3D display, but on the other hand it promises to be very comfortable to operate with its 8.9" size, which places it right between the iPad and the Galaxy Tab. The 3D camera on its back will allow you to capture 3D snapshots and video, which you'll be then able to watch on a compatible 3D TV or monitor. In addition, YouTube 3D will be integrated so that you can easily share your content with the world. 3. Acer Iconia Tab A500 - another underdog that turned out one of the most compelling tablet offerings at the MWC this year. Slated to appear on Verizon in its LTE reincarnation, the Acer Iconia Tab A500 boasts aluminum enclosure, and all the high-end specs cited above. The only thing missing in comparison with the Toshiba Tablet is the miniUSB port, but full USB and HDMI are still here. 4. Samsung Galaxy Tab 10.1 - Samsung takes all high-end specs above, save for the HDMI and USB ports, and bumps the rear camera resolution up to 8MP. Resolution doesn't mean much for good photos and video, though, and is even less so important on a tablet. Besides, it has an uninspiring all-plastic build, but what the Samsung Galaxy Tab 10.1 brings to the table is its rather slim and light design for a 10" slate - it is less thick and is lighter than all of the above offerings, which might make it the tablet of choice for some, if you can make do with only Samsung's proprietary connector and DLNA. 5. HTC Flyer - last but not least is HTC's first attempt at a tablet device, and we only tell about it last because it comes with a 7" display, and the rest were 10-inchers. It is much easier to carry around in this size, though, and looks and feels better than the first brand-name 7" Android tablet - the Galaxy Tab. It is the only one with a single-core CPU, but it goes way up to 1.5GHz, so don't worry it is underpowered. HTC brings in its usual unibody aluminum shell design to the HTC Flyer, so it looks like a true product from the company that won the "Device Manufacturer of the Year" award at the MWC Expo. Moreover, HTC managed to tailor its excellent Sense UI to the tablet experience, which, considering all the stock Honeycomb offerings (it runs Gingerbread), will differentiate it even further. Did we mention it also has a capacitive stylus for doodling and note-taking, as well as OnLive cloud gaming pre-installed? All of the above tablets are due in the Spring, save for the HP TouchPad, which will most probably hit the shelves in the summertime. With most tablet offerings already announced, we are waiting for the last major contender, Apple's iPad 2, so that the tablet wars can truly begin. it's up there! look again friend. Being that right now I have an Archos 101 and I think 10" is the only way to go. I gotta say on the Android front the Galaxy Tab 10.1" has to be my winner. When using the Galaxy Tab 7" at a Tmobile store I loved the fit and finish of the OS, they really spent the time to get 2.2 running well for that tablet. I have to assume that the same seamless quality will be there in the Galaxy 10.1" too. But I'm all about bang for the buck. If the Galaxy 10.1" is super expensive I'd never buy it. Really Android tablets need to be in the Sub $400 range to be a viable alternative otherwise the American people will just buy iPads cus there is no reason not to if the prices are the same or more. They don't realize that Apple products carry such an expensive price tag over the long run vs Android cus they're not keeping track of the Mobile Industry. I'm an Android Evangelist and try to convert people all over the place to Android but its a losing battle right now for the American public, they're hypnotized by Apples commercials. The only way another company will stand up is if they put in billions of dollars in advertising to become the 2nd hip company. I have a feeling HP can do it with WebOS once they leverage the OS into all of their products from phones, tablets, printers, dual boot laptops and dual boot desktops. Then they need to advertise the hell out of it and MAYBE they can do it. Otherwise Google needs to step up and advertise the hell out of Android to get the American public to realize that Android is an Operating System and that there is more to Android phones than just the "Droids" that Verizon has advertised. That all carriers have Android phones that can access this market that has 150,000 apps which are mostly free, and that these phones start all the way down to FREE and go up to $250 for the top of the line ones. The American public doesn't pay attention very well and it takes a lot of money to teach them the right things. Companies need to realize that if they don't advertise heavily Apple will take over the world. Google needs to start advertising for their Android OS on their own homepage, most of the American public use Google and they need to leverage their homepage to gain market share. Whether or not its going to be viewed as an Anti-Trust case I'm not a lawyer and cant say how they should do this. So right now I'll be sticking with my Archos 101. But it is pretty much in the air what my follow up tablet will be. It has to be 10" and have a dual core proc, but cost approx $400. Otherwise I'm really going to end up with a HP Touchpad to browse the internet, and respond to emails on. Cus WebOS is a GREAT operating system. I love Android and love all the free apps that make the functionality so versatile. But Unless the manufacturers work on lowering their prices Apple will win. For me the WiFi-Only Motorola XOOM remains the best Tablet at this time (No need for another 3G/4G monthly subscription when 95% of usage will be at home, and for the rest my next 4G Smartphone will have Theethering). XOOM has the best solid finish with Gorillia Glass, all ports and captors required including HDMI, SD-Memory and USB Ports. At $600 this WiFi only model will be just fine for me. 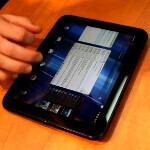 Recent announcements at MWC2011 did not overpass this XOOM. - Samsung 10" model dramatically lack HDMI, SD Memory port and a std USB port, and was a total disappointment for me. - LG model with 3D Photo and video capture, despite ridiculous old 3G display instead of expected Glass-Free 3D they only offered on their 3D Smartphone but not on thier 3D tablet, remains something to see in real, but poor odds for me that it overcomes this XOOM from what was said at MWC... So I long for this WiFi-only XOOM to be available at least in the US. If I was sure this US Version comes with International Power Supply as well as its multimedia accessories, I would even plan a trip to New Your in 2Q11 just to buy one ! yea my favorites are the G-Slate and Toshiba tablet. Forgot to add, I don't consider Tablets in sizes bellow 10" as an option for me, then I see HP/Palm WEBOS as a dead end that will never catch up. Plus I noted that HTC missed everything so far this year, with ZERO interesting/innovative High End Androïd Smartphone announced since last summer, and neither at CES2011 nor here at MWC2011, just releassing endless self-immitations of phones and a pathetic 7" Tablet. What happened to them since last June when their announced the tourrific HTC EVO 4G that made the rest of the World envy the US for a Smartphone,... after so many years of treating them as the 3rd World for mobile phones ? But so far that genius EVO 4G was NOT TAKEN TO EUROPE, other than partially in disappointing self-made immitations always missing something (Front facing camera here, kick stand or HDMI port there,...etc), and now it's too late. => If you don't treat Europe Better HTC, Europe will treat you same and just discard you guys. No way you can let us down like this ! What, no playbook? I guess we aren't big fans of operating systems that don't spy on us? why haven't you included a playbook in your series? it would seem that there are many reviewers that just aren't including the playbook in these tablet face off articles. is it because playbook is that bad (which i doubt) or is it because the playbook is in a class all its own and it wouldn't be fair to compare it with any of its rivals?